Sean McKeever, Alexandre Tefenkgi, and Jean-Francois Beaulieu take you to a frozen outpost in space where survivors work together to thrive under a protective dome. The next generation of citizens contemplates their predestined futures on the cusp of a severe weather event. 'Outpost Zero' #1 may be a debut issue but it reads like it could be issue 32 because it's so well conceived and feels lived-in. McKeever writes with so much confidence defining his characters' voices with interactions that provide so much info without feeling like an exposition dump. The primary cast is made up of teenagers who must take aptitude tests to determine what kind of career they'll enter that benefits the whole colony - discovery, engineering, services, etc. It's a microcosm of real life teens who also have to make some life-changing decisions as they enter adulthood. As with any group of people, teenagers especially, there are a lot of different personalities with opposing opinions. McKeever doesn't treat them like idiots, they're smart while still being kids showing passion, fearlessness, pettiness, and conviction. Alea, for example, wants to be on the discovery team like her parents exploring beyond the dome walls looking for more inhabitable environs. Steven deems it unnecessarily dangerous and fruitless to jeopardize everyone's safety. Why rock the boat if people are thriving within the confines of the dome, he figures. McKeever is able to add nuance and a rich backstory to many of the characters in this supersized issue. Tefenkgi has his work cut out for him as he creates multiple environments inside and outside of the dome. He perfectly captures different aspects of dome life from school to farming conveying scope all with clean lines and great detail. Beaulieu's colors inside the dome are warm and bright juxtaposed against the monochromatic frozen landscape outside the dome. McKeever and Tefenkgi work in tandem to bring out the emotional beats that express so much anger, fear, joy, and tension. 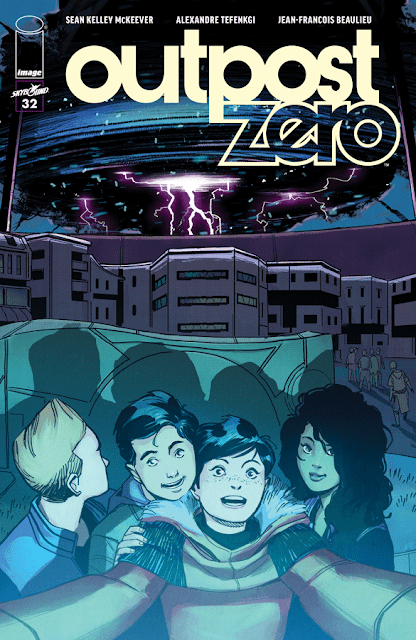 'Outpost Zero' is an immersive character-driven sci-fi drama that draws you in with relatable themes and smart characters. Despite being an over-sized issue the story flew by and McKeever has only scratched the surface of what's to come. This is as flawless a debut as you'll find in comics.